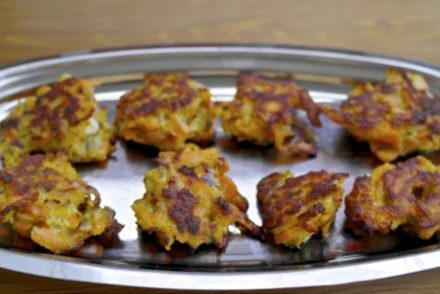 This recipe is one of my mother’s specialties and I have fond memories of eating it back in Chicago when I was a little girl. This is basically salted cod cooked in tomato, onions and raisins and accompanied by potatoes. Yes, I know-I know, it is another strange dish for a kid to like, but like I’ve said my mother only cooked Greek, and that’s what I grew up on. 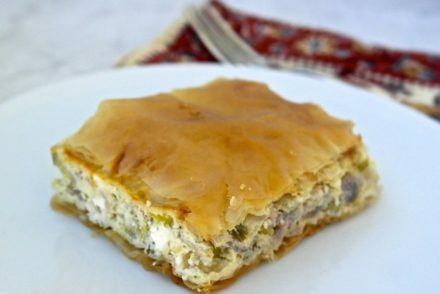 The dish is known as being a Peloponnesian dish (from the area of Peloponissos in Greece) where my mom and dad are from. 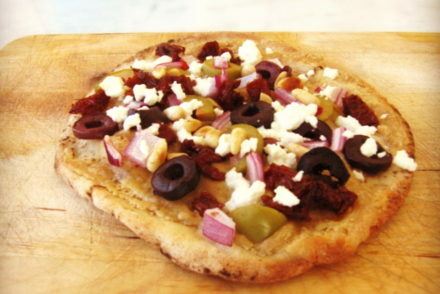 It is of the few Greek dishes that use fruit in a savory dish. The story goes that salted cod was first imported by the English and in exchange they were given Greek raisins. Korinthos another area in Peloponissos, was and is known for their raisins and according to George Mazos a Corinthian black raisin producer and owner of Golden Black, Greeks were in fact supplying the English with raisins so it seems that the two ingredients were somehow combined to create this wonderful dish. Now, although fish was available on the coastal areas of Greece, for the mountainous regions even on some islands fish was not so accessible, so salted fish was common as was salted cod which also lasted for a long time. Cod is an excellent source of protein and low in calories, with a 3 ounce serving (100 grams) providing only 87 calories and 18 grams protein. 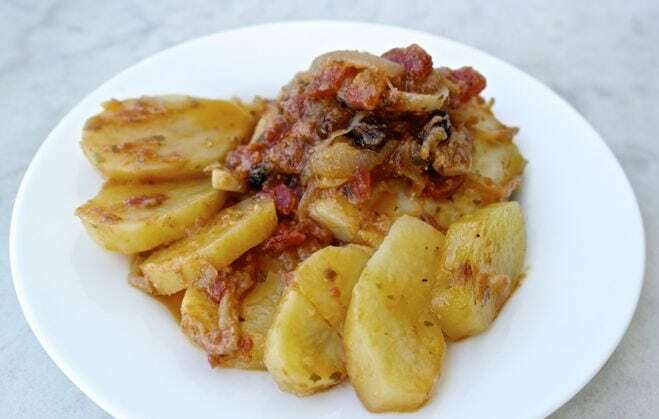 Combine that with the rest of the ingredients which are all great sources of antioxidants but also fiber, including the onions, tomatoes, garlic and raisins and really you have once again a super healthy Greek dish. The combination of the sweet raisins with the salty cod is addictive and is one of the reasons I loved this dish. Salted cod is associated with the Greek fast. During the Greek Easter fast, there were 2 days that fish is allowed, one of these days is the 25th of March which is the Feast of the Annunciation which also happens to be Greek Independence day. So on this official holiday it is common to eat salted cod. It can either be consumed fried with skordalia (garlic dip) or roasted with onions, tomatoes and raisins (bakaliaro plaki). This is a pretty easy dish, but you do need to desalt the cod a day earlier. Basically you cut the cod in smaller pieces (about 3 inches) soak the cod in cold water for 24 hours, keeping it covered and in the refrigerator and changing the water 3-4 times. In Greece this cod is found everywhere, outside of Greece you can find in Greek or Italian delis and supermarkets. Preheat oven at 350 degrees Fahrenheit (180 Celsius). In a pan sauté the onion until translucent or you can alternatively boil the onions until soft and drain. Bring the sauce to a boil and then lower the heat and let it simmer for about 10 minutes. Oil a large pan and place the sliced potatoes on the bottom. They should not overlap. Over that place the pieces of cod. Once your sauce has simmered for 10 minutes, add the raisins. Pour the sauce over the cod and potatoes (remove bay leaf), moving things around so that the sauce has gone everywhere. The sauce will not be very thick. Cover the pan with aluminum foil and cook covered for about 20-25 minutes, uncover and cook for another 20-30 minutes, until potatoes are done and all the liquids (except the olive oil) are gone. *I did not add salt because I tend to do that afterwards, but if you do, add a little as there will most likely be some salt still in the cod. *When roasting, you want to make sure the potatoes are cooked. The cod takes less time to cook, so check the potatoes, and if it needs more liquid, add some hot water through the corner of the pan, tilting it so it spreads. What a find! I saw an entre from MyParea on Facebook and followed the link. So far every recipe that I read was right out of my mother’s kitchen in Chicago!I could not translate her own hand written cookbook but you site is the next best thing. Yiassou! What a find! I saw an entre from MyParea on Facebook and followed the link. So far every recipe that I read was right out of my mother’s kitchen in Chicago! I could not translate her own hand written cookbook but you site is the next best thing. Yiassou! Thank you Nick! Glad you are enjoying! Enjoy your blog. Trying to get a handle on Greek diet. I also am from Chicago,living in Las Vegas now. My ma passed and it’s me and my dad now and I want to cook for him. We went and got the cod and already had it soaking. I remember that much.LOL My mom used to make this dish often. Thank you for the recipe.I am so glad I found you . Yassou Eleni. Ps Look forward to seeing more emails in my box. Thank you Spiros for sharing your story! This is one of my favorite dishes. Great recipe. What type of aine should i use? Red, white? Thanks Didi! White wine is preferable, but if you don’t have any you may use red.